Are you a souvenir lover? Well, you should consider visiting the city of Reykjavik. When it comes to souvenirs, Reykjavik is a great place to find things to take home with you. Souvenirs in Reykjavik started being sold a hundred years ago and they keep getting better and better. 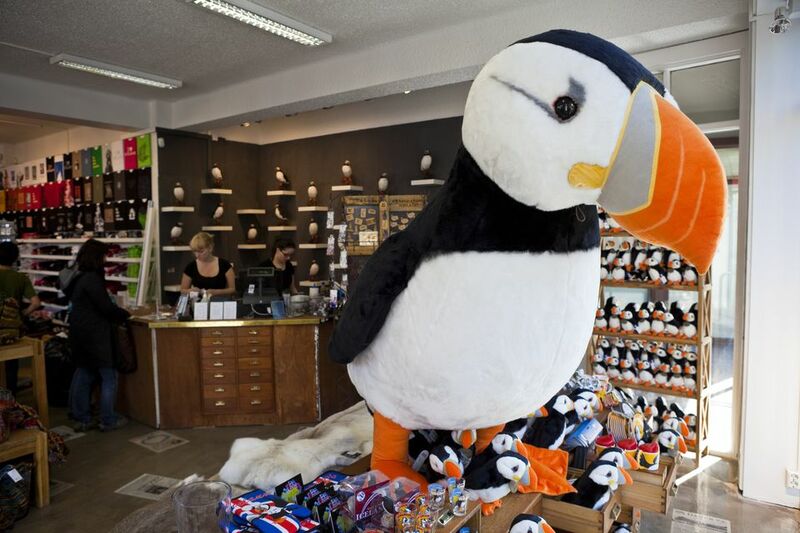 In Reykjavik, there is no shortage of souvenir shops. From the main shopping street of Laugavegur, souvenir shops are spread up to the city mall known as Kringlan and the phallus shaped mall of Smaralind that is located in the suburb of Kopavogur. Here you can find anything ranging from key chains, elf figurines, knitted goods, post cards to anything embodied with an Icelandic flag being sold. If tchotchke souvenirs don't do it for you, don't worry, the Icelandic souvenir list is endless. To start off, consider getting some lava rock jewelry. Unlike ash cans collected from eruptions, lava rock jewelry is a souvenir that portrays the volcanic nature of Iceland. You can pick up jewelry made of lava rocks ranging from rings, bracelets, necklaces, earrings, etc. Actually, that's also on our list of recommended Icelandic gift ideas. Also, T-shirts from Dogma are currently very popular souvenirs to bring back from Reykjavik. They are made for those who prefer the not so obvious souvenirs. In Reykjavik, dozens of designer boutiques and tourist shops sell these t-shirts. Photo books are the next souvenirs you will hardly be able to miss in Reykjavik. Every tourist shop in Reykjavik sells a coffee table worth it art book with Icelandic photos. Different landscapes, regions and Icelandic recipes are covered in the book collections. Get one of these and you will always have those beautiful photos to remind you of your time in Iceland. Also, while in Reykjavik, don't miss out on getting yourself a couple bottles of Reyka Vodka, the locally made vodka. Though the brand has begun expanding its distribution to countries like the United States, you get to enjoy 60% duty free per bottle if you buy Reyka Vodka in Reykjavik. While in Reykjavik you can also get some food to bring home, and have a taste of Icelandic dishes at home. A good example is the Icelandic hot dog mustard. Every restaurant in the city has this ingredient on its menu. Once you taste it, you barely can resist bringing some with you back home. It is usually a combination of mustard, ketchup and remoulade. Take some home. The above mentioned souvenirs are only a mere fraction of the types of souvenirs in Reykjavik. The list goes on and on. Reykjavik's stronghold in souvenirs is credited to the tourism industry getting stronger and the creativity and craftsmanship of the Icelandic people. Natives of the nation prefer preserving their culture and are proud to expose and share it with the rest of world. Souvenirs are used as a form of portraying Icelanders culture, landscapes, food, clothing's etc. Also, the souvenir shops in Reykjavik do not only sell souvenirs for exposure of Icelandic background but also to generate revenue. This revenue is usually used to run charity organizations, so it's all for good purposes. Souvenirs in Reykjavik have gained a lot of popularity since they are marketed well and sold at fair prices. Most people who visit Reykjavik carry a variety of these souvenirs back home and this has played a major role in popularizing them.